Our regrets and condolences to the family of Det. William Brewer. We can't begin to understand the level of grief, but we are deeply effected by your loss. We are so saddened by this terrible news!! Rest In Peace Detective William Brewer ❤️. We are thankful to you for your service. Our thoughts and Prayers go out to your family, and all of your sisters and brothers in Blue that protect us. God bless you all!! Bill, I’ll never forget our arrest competitions and your desire to have a family. Godspeed my friend until we meet again. Eternal rest grant unto them, O Lord, and let perpetual light shine upon them. The thoughts, hearts and prayers of everyone here at CCPD go out to the families, both blood and blue, of Detective Brewer. May the Good Lord give you strength, comfort and peace. My thoughts and prayers are with you and your family. You are a Hero Detective Brewer. Thank you for doing your job. Rest in peace Dear Brother. God bless. " "HEROES LIVE FOREVER"
Thank you for your service Detective Brewer.. Praying that God will give your wife, son and the remaining Peace, and Strength .. Earth has no sorrow that Heaven can't heal. I was so sorry to hear of the death of Detective Brewer. My thoughts and prayers are with his wife, son, his fellow officers, family and community. The nation has suffered a terrible loss. Rest in peace . Thank you for your services. Thank your family for sharing you to protect us. Bless you god speed. We have it from here. Detective Brewer sacrificed his life for a man that didn't appreciate his own. My deepest sympathies to Detective Brewer's wife, his beautiful son, and all his family. May you Rest In Peace, and thank you for your service sir. Thank you for your service and the ultimate sacrifice! May God bless your family! Rest in Peace Det. Brewer. Thank you for your service. 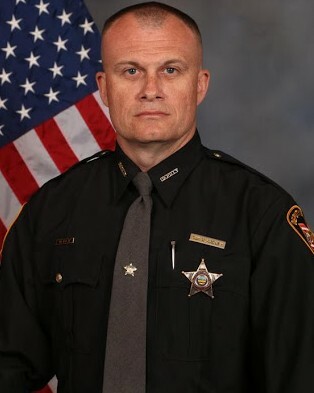 My thoughts and prayers are with the Brewer Family and the Clermont County Sheriff's Office.